A heartfelt thank you to everyone who supported my re-election and to everyone who took the time to vote in our municipal election for their candidate of choice! This was democracy in action and your votes made the difference in how the next four years will unfold. Thank you to all candidates who took on the commitment of the time and effort it takes to run an election campaign. To those that didn’t quite make it this time, there’s always next time. And in the meantime, keep involved, join committees, and participate. We need you! I’m looking forward to working with the new council and together achieving great things for both rural and urban Port Hope during the upcoming term! I’m hoping for your support in this fall’s municipal election. As Mayor of the Municipality of Port Hope the past four years, I’ve lead the effort working with PHAI towards making Port Hope the best example of “environmentally clean” that a town can claim. The process is not complete and I want to work as your Mayor the next four years to ensure that we’ll work as one to unveil a community befitting its new role as “the cleanest town in industrialized Canada”. While we have made great strides in renewing municipal policy there is still work to be done and I’m enthusiastic about what I can help accomplish as mayor during the next four years. Good Governance is possible when policies are reviewed and made current. It’s not time to change course. The Municipality is on the right course and I’m ready to devote my full time to continue at the helm to steer the Municipality in the direction that benefits the residents and businesses in our community. Get Involved – Get a Lawn Sign, Volunteer, Donate! Your participation in the ReElect Bob campaign can make a difference! Ways to help: Get a lawn sign, volunteer (even a few hours a week is a big help), and share our Facebook posts if you’re online. Donate online via link above, or by cheque made out to “Bob Sanderson for Mayor” and sent or dropped off at the Campaign Office. Thanks for your support! VOLUNTEER! Get Involved, Participate and have Fun! Canvassing can be fun, meet your neighbours, meet new people! 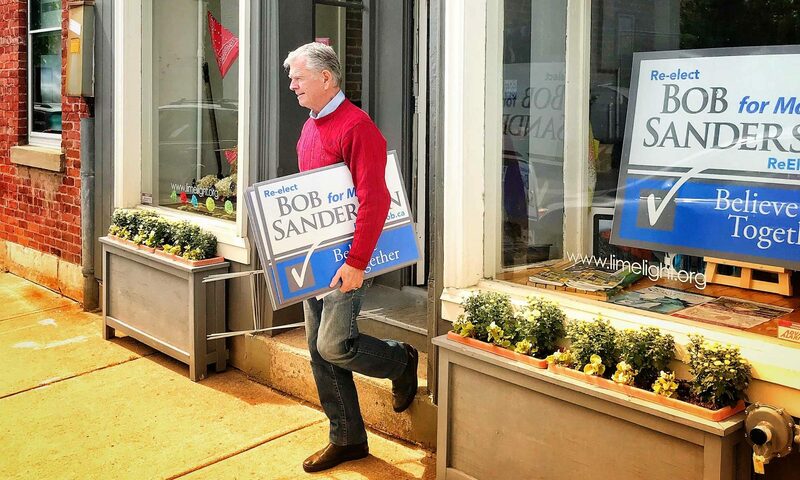 Get some exercise by doing some door to door canvassing for Bob! Drop by the campaign office or phone: 905-396-3616 or email. I’ve been your Mayor the past four years, and we’ve got a lot accomplished but the work isn’t over. I’m anxious to finish the projects that are still being worked on. If you’ve met me over the past four years at a public event, or at town hall, you may have heard me say “I’m old school.” I like to look people right in the eye and shake their hands. I mean what I say and say what I mean. Most of all, I don’t make promises — I make commitments. And this election, I re-commit to working hard as your Mayor on policies and projects to benefit the residents and businesses in our Municipality. Being Mayor requires skills in leadership, VISION and facilitation. The Municipality is on the right course and I’m ready to devote my full time to continue at the helm to steer the Municipality in the direction that benefits the residents and businesses in our community. As Mayor I have helped steer our efforts to steward Port Hope’s natural & cultural heritage – our main street, our lake front, our river, our picturesque agricultural rural area and our gateway to cottage country. The job is not done but the efforts have already been noticed and the municipality has become a preferred tourist destination and relocation site. I arrived in Port Hope in 1973 and opened Port Hope’s first full time veterinary practice. Having raised my family here I want others to do the same. My grandchildren live in Port Hope and I want to leave them a good legacy. I was on council when the last flood occurred and participated in the re-channelization project. Unfortunately the flood also derailed government funding that had been targeted for downtown development. The Jack Burger complex was also created with the support of council and citizen groups, , a significant achievement under the circumstances and this facility has proved to be a positive component of the community over time. I am a past member of the Rotary Club and feel service clubs play a critical role in supporting the community. I want to continue to work closely with them to help us become an even better community. When the Port Hope Golf Club and the Cobourg Golf Club amalgamated to form the Dalewood Golf Club, the Cobourg property was sold immediately to allow for residential and commercial development. I was involved with a group of local citizens that took it upon ourselves to lease the Port Hope property. It survived the critical time and is now the Penryn Golf club. It, along with the surrounding residences have had a positive and long term impact on our community. Not only has this helped our tax base but it has brought added value in the new residents (many of whom are active in the community). Good decisions produce good results. I strongly support our heritage and am proud to have received the Port Hope Heritage Award for my efforts in restoring one of the important heritage properties in town. The Little Bluestone on King St. was slated for demolition. It had been empty for more than 30 years, deemed to be unsafe and unsalvageable. The restoration of The Little Bluestone was done without any funding from the town or any other organization. This building is now one of the significant heritage buildings in Port Hope. I believe in Port Hope and have invested heavily in the town. I purchased and upgraded The Waddell Hotel (circa 1853) and established two award winning restaurants in the downtown core that provided a significant number of jobs. Under my ownership, the front of Black Beans Steakhouse and Lounge was restored to a historic format thus enhancing the streetscape. Earlier this year I sold The Waddell Hotel and my two restaurants, and am able to devote even more energy and time as your full-time mayor during the upcoming term. I also bring strong and successful business and corporate experience to the position. As a veterinarian I have worked extensively over many years with several major animal health divisions of major corporations in the nutrition and diagnostic areas. I have headed up veterinary healthcare divisions in Canada, the USA and internationally. To dispel any rumors to the contrary or any concerns you may have, I am happy to affirm that I’m fit and in good health, and enjoy spending my leisure time with family and friends – and an occasional golf game! Someone once said: “A leader is one who knows the way, goes the way, and shows the way.” I like that. Someone else once said: “Management is doing things right. Leadership is doing the right things.” I think that pretty much nails it – and I’d like your vote this October so the progress made the previous term can be solidified and enhanced. The Capitol Theatre, at the Cameco Capitol Arts Centre, with its outstanding live theatre performances brings in tourists and theatre-lovers from the surrounding areas and is an important economic driver in the urban core. In fact almost 80% of ticket sales are to people outside of the municipality. Annual events like the Cultivate Festival, Float Your Fanny Down the Ganny, and the A.C.O. House Tour, not only bring in tourist and economic benefits, but also enrich the lives of our local residents. The Farley Mowat Memorial is another example of Port Hope’s unique community spirit and appreciation of our local Port Hope history and culture. I’m particularly proud about getting our “temporary” Barrett St bridge replaced with the help of the military. Together we can do great things! VOLUNTEER! Get Involved, Participate and have Fun!